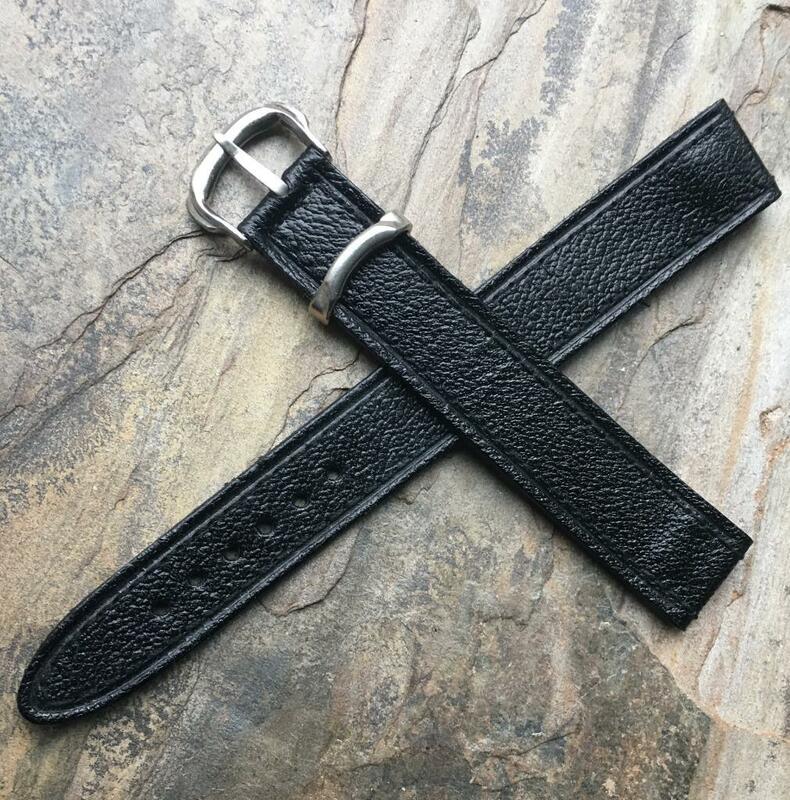 Military watch collectors won't want to miss this rare opportunity to get a WW2 era vintage open-ended leather watch strap in a rare Extra Long Length with 18mm wide ends to fit many fixed-lug watches. This is one style of the 75 vintage open-ended bands we have in stock at Squinky.com in all sizes. This type of old vintage watch original 1940s open-ended band is getting very scarce. Discovered as New Old Stock, never used. 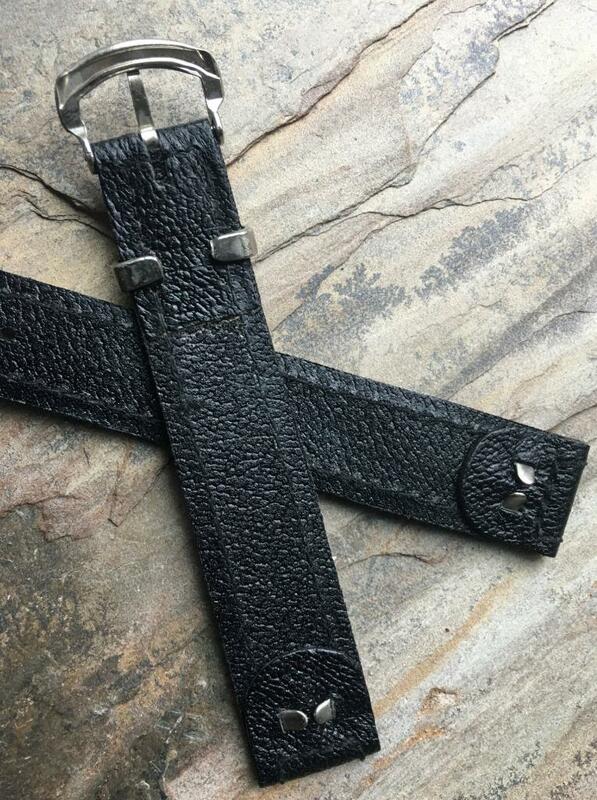 Fine black pinpoint pattern thick band material known as Moroccan Leather, very popular in the day. Fully stitched for durability. 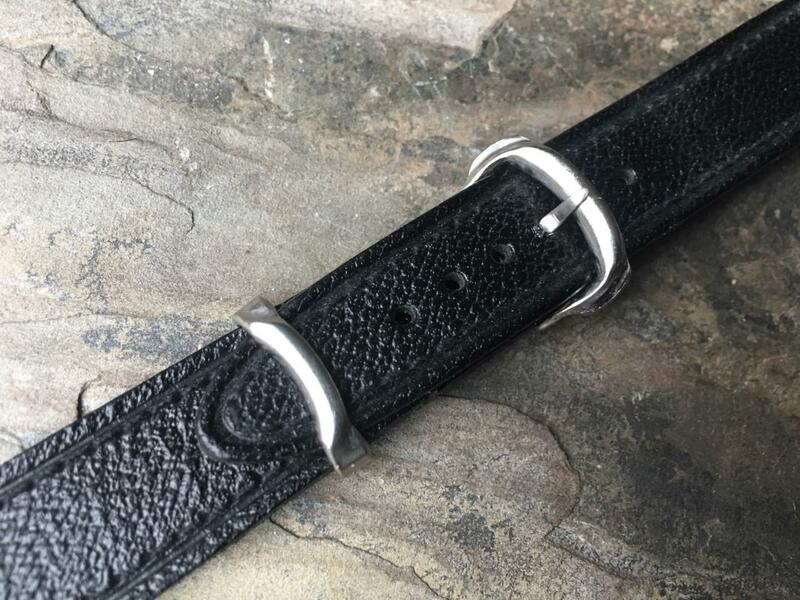 This band has a uniquely shaped matching nickel steel buckle and single sliding keeper. Special ends meant to slip over fixed lugs bars of an early vintage military watch or other wristwatch that needs an open end band. 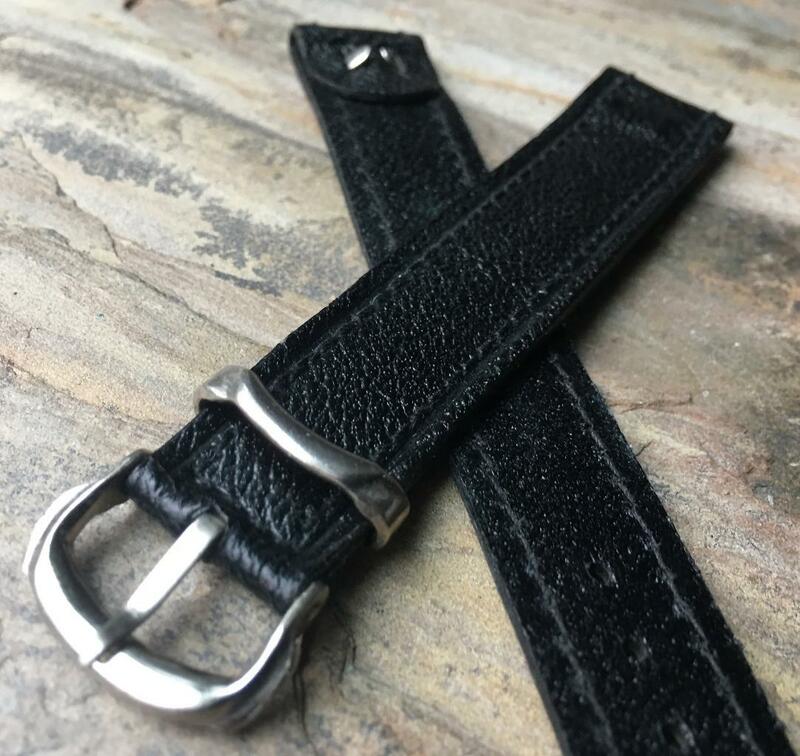 Has clips built into the that slip through the strap piece and clamp down for total security and this type of open-ended band is easily removed and shifted to another watch. Thick band that is strong and supple. 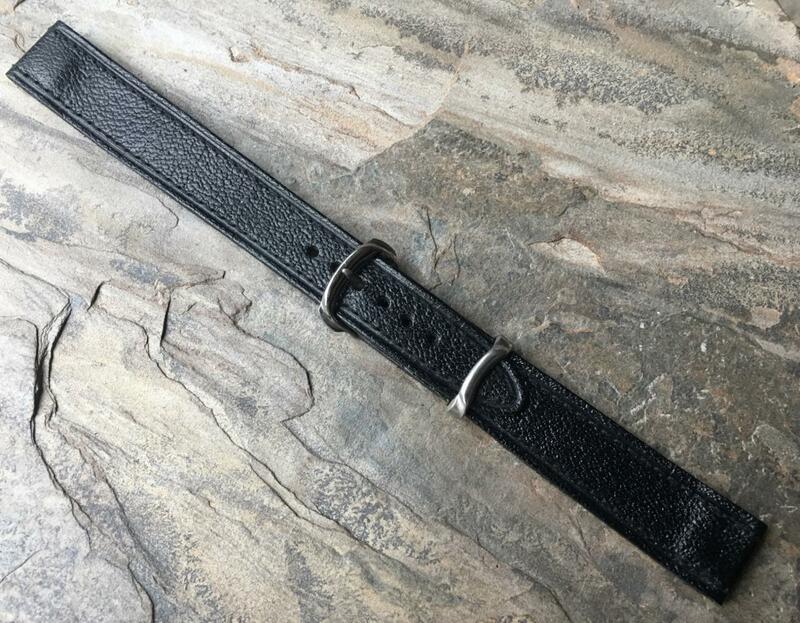 This Long Length strap measures 9 inches long (23cm) when placed end to end, not counting the buckle, with the ends closed. That is 1 1/2 longer than a standard strap. Metric measurements of the two pieces are 140/90mm. Strap has st rong thickness of 4.4mm where the band meets the watch and 2.4mm at the tail end. Buckle end is 16mm if you want to substitute another buckle. U.S. shipping $5.99 or Free Shipping if you buy two. International shipping is $19.99 for any number of straps ordered at the same time. 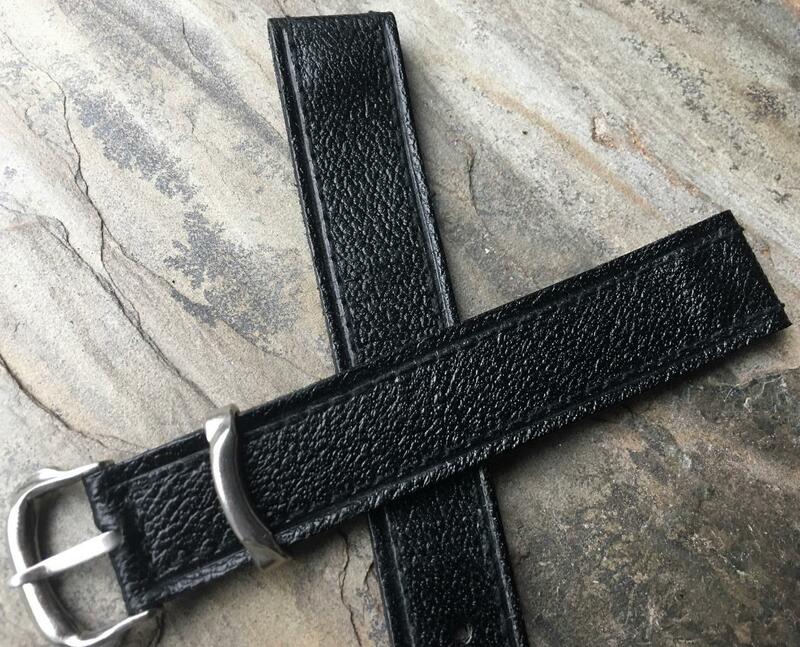 I have many more open-ended vintage leather straps for sale at Squinky.com in both the Aviator’s screw fitting style and many types off Open-Ended Vintage Bands, plus many original branded 1940s Pigskin straps like these signed Gruen, Elgin, Bulova and Hamilton. Plus we have a number of steel bracelets with open end tubes that will slip over fixed lug bars.